Host to great Americans since 1716. Originally built in 1716, and ran as a hotel since 1889, The Colonial Inn has stood as an enduring landmark of gracious hospitality in historic Concord. Listed on the National Register of Historic Places, it lives in the midst of revolutionary and literary history Including the Old North Bridge, the Wright Tavern, Walden Pond, and the homes of Alcott, Emerson, Hawthorne, and Thoreau. The Inn has been the gracious host to many through the years, including such notables as Franklin D. Roosevelt, J.P. Morgan, Margaret Lothrop, John Wayne, Kurt Russell, Goldie Hawn, Shirley Temple, Tammy Grimes, Steve Martin, Graham Stedman, Faye Dunaway, Dan Quayle, Ritchie Havens, Glenn Close, Bruce Springsteen and Queen Noor of Jordan. We hope you will join all those who have visited the Inn and cross paths with history. 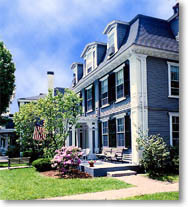 At the center of the American Revolution, Concord�s Colonial Inn is ideal for vacationers interested in the area�s history and numerous attractions just a short trip away. Start at the "Battle Road", where American Colonists traded fire with British Regulars. Visit Boston, where professional sports Team up with other major Historical and entertaining attractions. And New Hampshire�s lakes, seacost and white mountain region are easy day trips away. The Colonial inn offers vacationers a relaxing ambiance that lets you rest easily after your day�s events. 56 guest rooms incluiding suites and apartments. Enjoy Fine seafood and New England fare in the traditional dining rooms and nightly entertainment in the village Forge Tavern. And apartments and Suites are available for longer vacations. Call us today, we want you to join us in the American Tradition. Click here to see our rates and packages.